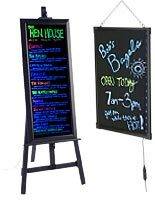 Pair these chalkboards and marker boards with some nice penmanship and a motivational slogan or some drink specials for an instant signage success! From schools, to offices, to restaurants and bars, these write-on surfaces are perfect for just about any use. Plus, these marker boards can be used and reused again and again! Simply write or draw your message on any one of the boards white or black surfaces to turn your board into the messaging tool of your choice! Depending on the surface, we reccomend neon wet-erase style markers to really make your message pop! 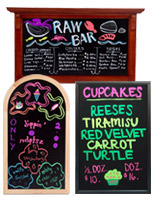 Colorful chalk is also a great choice for chalkboard easels when placed outside a shop or restaurant. These marker boards are incredbily conveneient because when it comes time to change your message, just wipe it off! With boards like these, there's no need to invest in custom signage when you can use a write-on board - esspecially if your messages are constantly changing. Our LED boards are particularly popular for restaurants and bars. 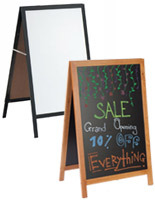 Business owners love to hang these boards in their windows to display specials and sales in a bright and eye-catching way! Some of our wet-erase marker boards even come with fun, neon-colored markers included! 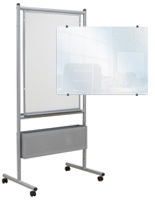 What more could you ask for in a customizable write on board?